Are you on holiday at Center Parcs Het Heijderbos or staying nearby? 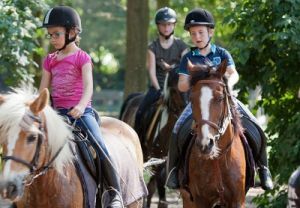 Why not book your child’s first pony ride or a lesson with one of our professional instructors? You can also explore the woods on horseback or in a horse-drawn covered wagon. Young or old, novice or experienced rider? We cater for all age groups and levels of experience! We also offer activities for those with a disability. Children love the adventure of sitting on a pony. For the youngest we offer a half hour walk out in our own little forest. The child has to be accompanied by a parent or responsible adult on foot holding the lead rein. Bergemo staff will instruct parent/responsible adult and child in advance. Afterwards the pony may be treated to some horse candy. Pony walk outs can be scheduled almost every day! Booking in advance required. Please check out the activities for dates and times! A 30 minute walk out costs €13,00 per pony. 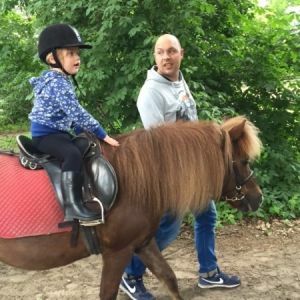 Equine experience lessons for riders of all abilities! This session is designed to give you a taste of the horse riding basics. After having learned the necessary skills in the arena, you will be riding through our private forest accompanied by an instructor on horseback. Suitable for riders from the age of 8. No riding experience required. For anyone who wants to get acquainted with the basics of riding! First, the riders will start in the riding area. The instructor will explain the basics of riding. When everyone has the basics mastered, the instructor will climb on his horse and we go into our Bergemo-forest. Participation in this combination is possible for riders from 8 years. This activity requires no experience. This class is meant for riders from the age of eight, who have had at least 20 to 25 instructional lessons. Required abilities: rising trot, steering and the three basic gaits of walk, trot and canter. If you have an FNRS Ruiterpaspoort, please bring it with you, so we can assess your level of experience at a glance. Group lessons cost from €23 per pony and €26 per horse. This option is available for intermediate or advanced riders. After having groomed and saddled the pony/horse you can ride unsupervised in one of our arenas and practice for example dressage. Riders who wish to ride without supervision must have a Ruiterbewijs (rider’s license). The ability of riders who do not possess such a document, will be assessed during a group lesson. The assessment will take at least 15 minutes and, after demonstrated ability, the rider may ride unsupervised in another arena. Riders deemed not to possess sufficient skills and experience will have to stay in the group lesson. Hacks/treks, covered wagon rides, pony walk outs or 'your own pony for part of the day’? For holidaymakers we offer a wide variety of horse-related activities. Interested in a hack/trek, covered wagon ride, pony walk out or having ‘your own pony’ for a part of the day? Click here to find out more.